Jack Russell Terriers, long known as the most,famous dog breed, are now even more famous. One is particular, "Uggie," was born in 2002, was rescued from being sent to the pound by Omar Von Muller, after his original owners that thought he was too wild. 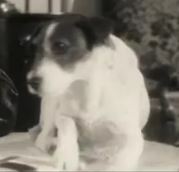 Uggie, the Jack Russell Terrier, is now famous for his movie roles in "The Artist," (2012) and "Water for Elephants" (2011). If you've seen "The Artist," in particular, you'll quickly understand how talented this Jack Russell Terrier is as he steals the show. Uggie is a real star who may even be the reason why a "dog" category may be added to the many movie awards given out each year. The dog from "The Artist" and "Water for Elephants"
The above photo is from the hilarious movie of 1938 Bringing Up Baby starring Katherine Hepburn, Cary Grant and an extraordinary little wire haired Jack Russell Terrier named George. But George was only the name of his character, and what a character! 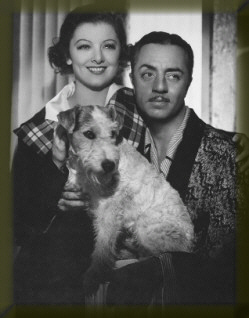 His real name was Skippy but became better known as Asta as he was called in the 'Thin Man' movie series co-starring with Myrna Loy and William Powell. He stole a lot of scenes and a lot of hearts and was one of the most loved and most well known dog breeds in Hollywood during the 1930's and 1940's. Asta was used in a lot of Hollywood films such as 1937's The Awful Truth where he plays a character named Mr. Smith. 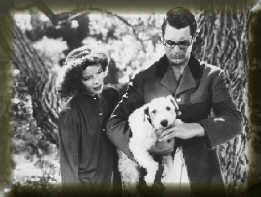 He also played a ghost dog named Mr. Atlas, starring again with Cary Grant in 'Topper Takes a Trip' in 1939. All these vintage movies were adored by the public...and it was Asta's spiffy little Jack Russell personality that gave them their endearing charm. He was smart as a whip and cute as a bug. 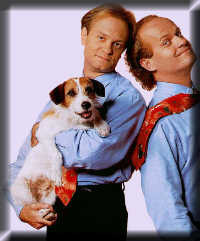 But it seems there have been even more Jack Russells featured in today's movies. 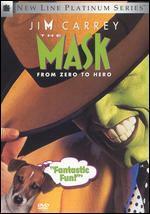 Like Milo in the movie The Mask, and Rimshot from Ernest Goes To Jail. Then there's Stupid from the hilarious movie The Jerk with Steve Martin. But this doesn't even scratch the surface. This famous dog breed is just everywhere. Not to mention the world of television like Moose known as Eddy from the TV sitcom Frasier, who, as some of you might remember, parachuted into Super Bowl '96 with Jerry Seinfeld star Jason Alexander. Or Wishbone from the popular PBS children's series by that name. And we haven't even touched on the endless TV commercials! This Jack Russell is even found in Comic books. Superman's flying dog was a Jack Russell Terrier! So you don't have to wonder what famous dog breed is Hollywood's, as well as Television's, as well as the World's first choice in dogs. Without a doubt...it is the Jack Russell Terrier.